*Optional meal plans and 1-on-1 nutritional support + More! Enter The Draw To Get The ENTIRE Challenge FREE! receive a ​Free Life Style Assessment Questionnaire! Enter your details below to officially pre register. You will also receive all the details + your free life style assessment questionnaire. So... What is Fit My Jeans Challenge? Grab a pair of Jeans that you cannot quite squeeze into just yet. Your goal by the end of this 6 week challenge is to be able to fit into the nominated pair of jeans you bring along on your journey. 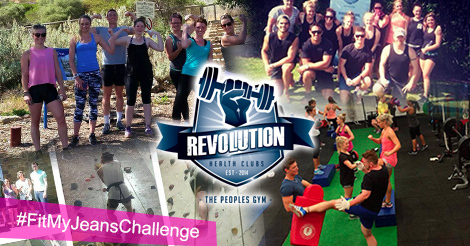 With the support of Revolution Health Clubs, the great personal trainers and in line with a nutritional expert, you are given the best opportunity to make a well needed change in your health and wellbeing along with having a great time and meeting like-minded people aiming for the same destination. Simply enter your details below to officially pre register and enter the draw to win! You will also receive all the details + your free life style assessment questionnaire.